Striped dresses are every where at the moment. Actually any dress is always trendy. A dress is so ideal to wear in the winter. If it is too cold, wear a legging instead of tights. And a cardigan over it, or a jacket, looks always good on any dress. And if you are just as often cold as I am, you can also wear a shirt and a basic shirt with sleeves underneath. Yes you read it right, four layers! I wear four layers in winter. In addition, you can wear every shoe or boot under a striped dress like this. Every style fits with it. It’s a shame that so many women see dresses as a party outfit and not as a daily garment. You can style a dress as casual as you want it to be. 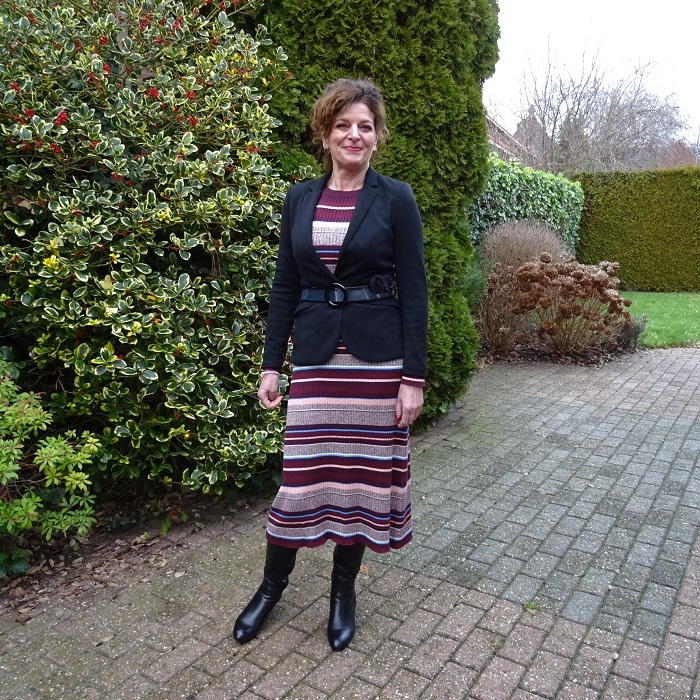 This is the second dress I bought from Gerben’s Christmas package. This dress is quite long. Because I have a long upper body it doesn’t look good when I wear nothing on such a long dress. A belt just below the waist would do the trick, but I wanted to wear a jacket. A short jacket would only accentuate the length of my upper body and a long vest would make it more dull. A blazer that falls just below the hips “breaks” the length so that everything falls back into proportion. The trend of this season is of course to wear your blazer with a belt. This translucent one fits perfectly with the look. And I added two black hair pins to the belt. The dress needs nothing more then that. I do not know if you already have seen enough of these boots, but they are just so good! If you can spend it, invest in some good quality black leather boots! Absolutely love the blazer and boots. Love this printed dress. The blazer looks nice with it and chic. I wish I can rock similar dress. I am shortie with short uppers I try to stay away from under the knee dress though I adore them. I can understand that. Shorter dresses look more good on you! I love this striped dress Nancy. Chapeau with this belted Blazer. Great dress! It looks so stylish, and very comfortable at the same time. It is super comfortable! Thanks Tiina! Love this dress! I almost bought it a few weeks ago but they didn’t have my size. Oh that’s a pitty. It wears so comfortable! Wow this dress looks so nice on you! Love the way you styled it. 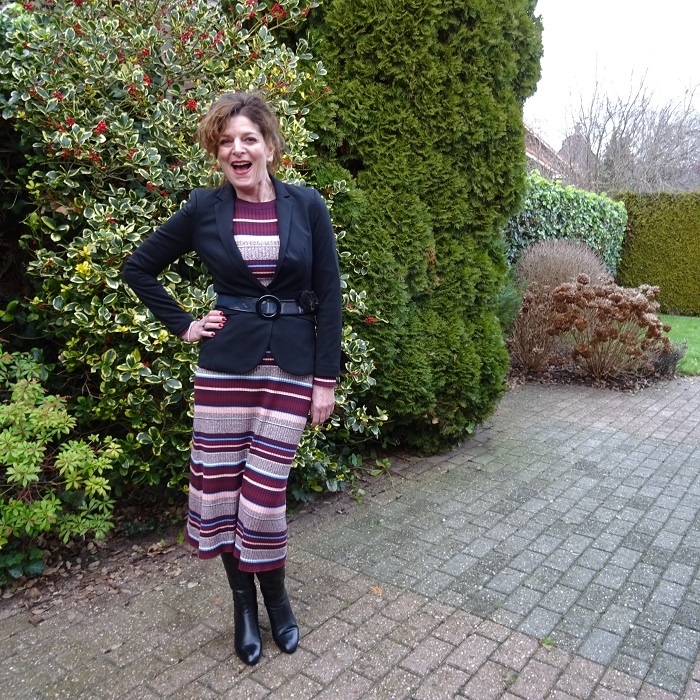 Love how you styled your dress and that you belted the jacket showing off your tiny waist! Your blazer is super cute. You look gorgeous in your outfit too. How funny….I was just looking at a striped dress like this at the store yesterday. I talked myself out of it, but I may have to go back. It’s perfect on you. And I love how you added the belt to the blazer, Nancy. Thanks Jodie. I think a striped dress always looks good and is so easy to style. I think I will wear this outfit today too, having lunch with girlfriends! Wow! this certainly shows off your figure Nancy. You look fabulous. The dress is gorgeous! I would definitely wear the blazer too! You look fantastic Nancy and the photos are stunning too! What a wonderful complete look, that stripped dress, belted jacket and knee high boots are just lovely together. Beautiful! Blazers add beauty to your stature. Adding the belted blazer was a great idea. It really give the dress a good shape and looks great on you. What a spectacular striped dress that is, Nancy! 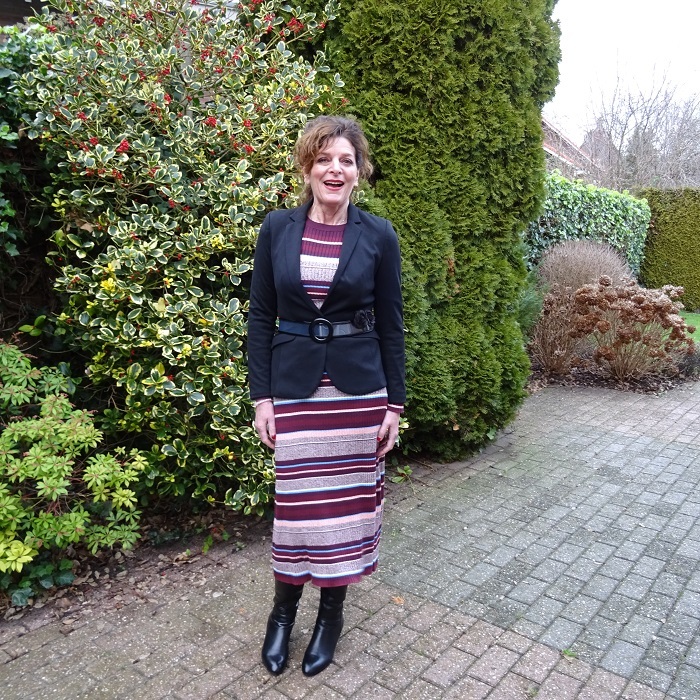 I have a long striped dress too – look at me, I’m on trend, ha ha! 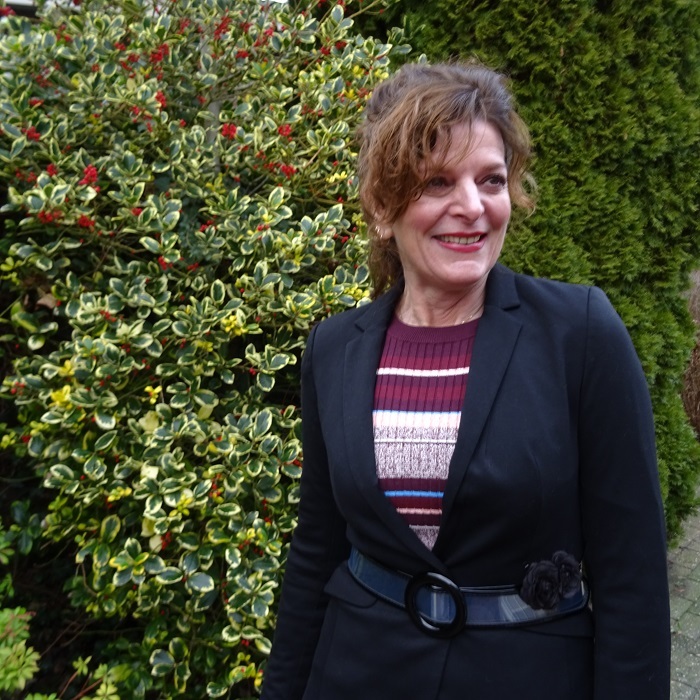 I’ve been belting my blazers for years – it’s always odd when a trend comes around again. Love this whole look. Yes it is, like it’s not a trend at all! I also in crazy about stripes this season. I particularly like this sweater dress and that beautiful navy jacket. It looks very comfortable and yet so chic. You look really pretty and also as if you were having a lot of fun. Thanks Elle! I am always having fun in the present of my hubby! Thanks Maria, it’s a great dress to wear! Loving your dress!! It’s so cool! Very elegant, my dear. I really like the dress, beautiful, comfortable and warm for sure. Yes it is nice warm. I am taking it with me to the uk this weekend! The dress is lovely and the blazer created this so wanted hourglass figure. Thank you to share with My Red Carpet. Thank you very much Anna Shirley. Lovely look dear, so elegant and classy.